Food That's Tasty, Healthy and Naked? That's Quite a Find! What’s your favorite health food? Tofu? Carrot juice? Pizza? The folks at Naked Pizza are on a mission to launch the world’s largest grassroots health movement. In October 2010 John & Shannon opened their first of a hopeful 15 area Naked Pizza franchise stores. This one’s located on Route 434 in Altamonte Springs, just north of Orlando. Their pizza is round, saucy, cheesy and comes in a square box. So what makes it healthy? It’s naked: Meaning it’s made from all natural ingredients that taste better and are better for you. It’s not meant to be a diet food. The sauce is all natural, spiced and herbed with no added sugar or citric acid. The cheese is rGBH-free real Wisconsin mozzarella. The meats and veggies are all natural, no additives and free of growth hormones and antibiotics. Wow! With all this talk about the health benefits, I was skeptical. How would it taste? No need to worry, the pizza was quite tasty; surprisingly so! In some ways, it was just like any other pizza you’ve ever had. In other ways, it really was possible to enjoy the flavorful crust, spiced & herbed sauce and real dairy cheese. With all these special ingredients, I wondered how much more expensive it would be. Again, to my delight, the price was similar to what one would pay at any other pizza chain. 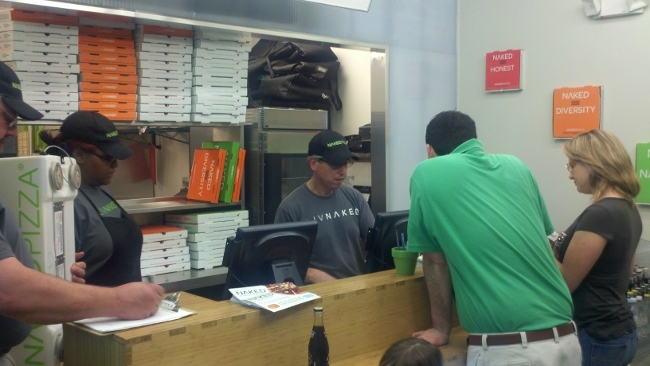 In many ways, the pizza was a reflection of the store. The store had the same appearance as a regular pizza store–front counter with phones, large ovens, square pizza boxes stacked and ready to receive a fresh, hot pizza. In other ways, it was quite different–bright and minimalistic, large TV screens with information and advertisement, social media screens on the wall where you could sign up to be a fan of the store. I spoke with John & Shannon, the owners of this franchise. While this is only the 4th Naked Pizza store in the US, there are over 500 stores under contract. This includes John & Shannon’s committment to opening 15 additional stores in the area. They said they were attracted to this concept because they believe in the healthy, naked approach to the food industry espoused by the founders of Naked Pizza, one of whom they referred to as a nutritional anthropologist. Although it was clear from our conversation that they were nervous about the sales volume in the five months since the store opened, they expressed confidence that they would find their market. Based on how the pizza tasted and how competitively priced it was, I think they might be right. This entry was posted on March 23, 2011 at 7:47 pm and is filed under Restaurants. You can follow any responses to this entry through the RSS 2.0 feed. You can leave a response, or trackback from your own site. Hey Lance – Ellen from Naked Pizza here. Thanks for the mention. We’re out to change the nutritional profile of fast food using our all-natural pizza as a Trojan Horse to leverage the $50 billion global carryout and delivery pizza industry. Opening the conversation about the food we’re putting into our bodies and how it affects us, and participating in honest and authentic engagement with friends from all over the world through social media. Hope you’ll visit Shannon and John again, and tell your friends!